If there ever is to be a sequel to the book Start-up Nation, Israeli high tech must become as serious about product design, customer experience, and business models as it currently is about technology and R&amp;D. Over the last decade, Israel has mastered an entrepreneurial/venture model, which involves sourcing entrepreneurs from military technology units, creating cutting edge technology products and ultimately selling a company, its IP and personnel to one of many foreign multinationals that have come to appreciate the Israeli brain trust. While this model of start-up creation has served us reliably, it is vulnerable to macroeconomic headwinds and is increasingly unsustainable in the face of technology commoditization that is rapidly approaching our shores in the form of competition from China, Korea and Taiwan. As it turns out, our over reliance on technology creates an endless demand for more technology talent, which prevents us from nurturing vital competencies in product, design and business. The resulting ‘tech crutch’ is a self-perpetuating cycle that threatens the future of Israeli high tech. This challenge of moving beyond technology is more important than ever if Israel is to enjoy its rightful share of the high tech economic pie. The underlying reason for this is that Israel is stuck pursuing a goal of technology creation rather than technology application, and this mindset affects entrepreneurs, venture capitalists and government policy makers alike. As a result, we generally prefer to enable others to build amazing products, rather than to use the technology to build the products ourselves. We hesitate to touch the end customer and resign ourselves to being technology merchants, promiscuous with our technology smarts but timid with our business creativity. This is a problem, because increasingly the fattest margins and steepest barriers to entry belong to those who know how to apply technology to build a better business. We too often overlook the fact that users of technology often enjoy a disproportionate share of value relative to the technology creators. 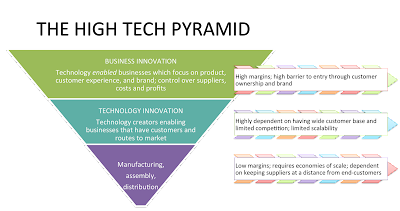 This is because technology increases efficiency and reduces production and distribution costs, thereby enabling new business models to emerge, thrive and engage directly with their customers (think Netflix, Salesforce.com, Amazon and eBay, none of which were initially based on technological innovation). As the pace of technology commoditization hastens, the value of high tech is shifting even more to those companies that can apply technology to create or upend a huge market opportunity. These companies find a way to be as close as possible to their end customer, to maximize exposure and to extract the maximum economic value. This is a key reason so many venture investors favor companies that can leverage the Internet to reach consumers and businesses alike. High tech in 2011 is about innovation, but not necessarily technology innovation. Unfortunately, too many Israeli companies seek shelter with their technical differentiation, and assume that distributors, OEMs and acquirers will recognize their unique offering and spare them the daunting task of building a business on their own. Of course, there are a handful of success stories where high tech companies have struck gold licensing their technology, winning the lottery OEM or signing lucrative and scalable revenue sharing deals, but these lucky few cannot be role models for the rest of us. And even though there will continue to be amazing technology companies emerging out of Israel, this is too small a base for an entire industry to rely on. To reach the top of the pyramid Israel must now embrace product, marketing and business innovation, just like it has technology innovation. Such a shift does not require abandoning its technical roots, but rather using this technology strength to create higher order products, and mustering the talent and courage to bring them as close to the customer as possible. In some cases, the business innovation may even require providing technology products for free. The key is that while Israeli start-ups can still use technology as a differentiator and competitive advantage, long term shareholder value and competitive barriers-to-entry will ultimately be built on brand, loyal customers, and a profitable model. The shift in mindset starts with how we found, fund and grow start-ups. Israeli start-ups must identify a real business pain and solve it with a great product offering, rather than solving a technology pain with technology solutions. Our distance from many of these business pains makes developing deep industry understanding a challenge, but this distance also enables objective observation and analysis, which can itself fuel innovation. We all recognize that Israel has both strengths and weaknesses in high tech, but for too long we have allowed ourselves, collectively and individually, to invest solely in our strengths, accepting our weaknesses as destined. High tech is a competitive sport, and just like athletes invest more energy in improving their weaknesses to remain competitive, so Israel must devote more attention to its weaknesses in product, design, marketing and business. The success stories that will come out of Israel over the next decade will be those companies that defy conventional wisdom about what can be done in Israel. Countries with great natural resources like oil need to develop capabilities in refining and distribution to reach their true potential as an energy powerhouse. It is no different with a natural resource like technology talent. Israel must avoid becoming an “oil state” in which only a small percentage of the population can participate, and where there is dependence on selling the natural resource to others who know how to extract value. To address these challenges, we must stop thinking about our high tech industry strictly in terms of engineers and programmers. By emphasizing only the R&D side of high tech, we have in effect erected walls around the country’s only growth engine, which in turns only exacerbates the technical talent shortage we hear so much about. With the current model Israel may always face a shortage in technical talent, but it will face far more acute shortages in marketing, product and design talent. Therefore, we must encourage our engineers to explore and develop their latent creative and business skills. These multi-talented people are rare, but they certainly exist. We must also find ways to make high tech more inclusive and inviting for the less technically inclined and for those who didn’t have the privilege of serving in an army technology unit. In short, Israel’s natural resource is human talent, not just technical talent. 1) Incorporate strong marketing, product and design skill sets at inception, including in the founding team. This cannot be an afterthought post development, and it really shouldn’t be outsourced either. 2) Innovate on the business/product side as well as on the technology side. Recognize that you are building a business, not a product and certainly not a technology, and practice pitching this business idea with minimal mention of technology. Technology innovation is great, but it can create tunnel vision for the creator, and confusion for the employees and shareholders. 3) Determine whether you could be going a step further in your product or business plan to ensure that you are getting the maximum value out of your innovation. Can you build a product based on this technology.? Can you build a service based on this product? Can you go directly to the customer using the web? 1) Bring high tech business into Israel’s academic system, not by offering internships for developers, but by exposing students to the non-technical side of high tech, whether it is business in China (Eastern Studies), online marketing (psychology), user interface and experience (industrial design), successful business models (economics), etc. Conversely, Israeli universities need to create more multi-disciplinary tracks that combine computer science and design, or engineering and economics/business. 2) Find ways and incentives to integrate the super creative talent in the Israeli advertising and media industry (which is already an export industry for Israel). 3) Expand the narrow mandate of the Chief Scientist Office (CSO) beyond simply creating R&D jobs, to include strengthening Israel’s non-tech weaknesses. The CSO should provide tax incentives for multinationals, which establish marketing, customer support and other non-technical functions in Israel. Most importantly, the CSO should provide grants to start-ups for the launch of their product or service, not its development. Israeli high tech is in a transition, not a crisis. The proof is that many start-ups have already made this mental leap and are attempting to reframe Israeli high tech as masters of business and marketing, not only patents and architecture. Israeli high tech will be stronger in years to come as we hone the creative and business talents that so many in this country possess. But, too often, we leave money on the table. Not because we sell companies too early, but because in many instances we don’t take or are unable to take the extra step to seize the larger business opportunity. There is a lot of work to do, but it all starts with recognizing that high tech is not just about tech, and that our technology strength must not become a crutch. As in the past I worked with many companies here, I can testify that actually most successful companies (best sales : ) were making it big mainly because of finding the right application for their technology, and presenting it in sharp and concise way: 2 minute videos! Really - it comes to "it's what you do with it!". Even in the area of marketing, great majority of companies still misunderstand technology with the message: "Looking for Social Media guru", "we're looking for someone who breaths social media", etc. Hey, social media is just another media : ) What about the message? There is constant confusion that platform carries most of the value. Adding creative values component into the mix I believe will pose a serious challenge. Lack of educational base - as you mentioned is one problem, but much bigger obstacle will be to relatively quick alter the industry's mindset in regard to actual formation and funding of start-ups, and assist/educate high-profile people, managers, and investors to better understand "human/user side" of the market. Although many experts are analyzing and trying to emulate Apple's success, I wonder how many realize that Apple actually made long step forward - and jump into convergence - area where technology, user experience, distribution, marketing, and relative openness - all have to converge into a unified offer. Today - name of the game is convergence. Being very high on the black-list for creative copyright breaches, we have some way to go - to successfully introduce value of creative intellectual property into the industry. If it sounds interesting, I can create nice valuable document of case studies - describing symptoms of successes and failures across various high-tech companies I worked with. It will be an amazing read. Even if we leave ambition of making "awesome design" behind, for the first stage it should be a no-brainer that companies need to know really good WHAT they want to create BEFORE hiring programmers! Lots of companies (80%?) start with hiring programmers way way way before they have a remote clue WHAT their product will do, and HOW their product will do it (dependent on WHAT - of course). Imagine how much money can be saved by prototyping (warning: this is completely unused and nearly-forbidden term in the industry : ). Such an important post Adam - thanks ! To your list of national level ideas it is important to add a good academic program in the area of user experience design, industrial design is a different specialization. Yes! Right on the money. Nice job. So, how many of our universities offer degrees in interaction design, human-computer interaction, user experience design? You've covered the key issues excellently and, while fundamental change is needed, I read this as an optimistic call-to-action more than anything else. Adam, this is really a great post IMO. I've been seeing very similar things from my point of view, being a UX designer. It doesn't stop at startups. The whole web industry in Israel is technology-biased. When considering a new digital product, companies tend to overestimate technological aspects and either underestimate or completely ignore "human factors" such as design, usability, branding… This is often true even for internal systems, used by the company's own employees. Over the years I have found myself too often asking my customers "what's in it for the user?" To which many of them replied with confused, incoherent answers or just surprised gazes. We need a solid academic route for people who want to become user experience designers, customer experience designers etc. I think it's absurd that there is still not a single worthy place to study any of this. We need a governmental standard for usability. Some of the government's own websites are barely usable; others are just "OK". (You may recall the poor attempts taken by both Likud and Avoda parties to have the primaries done digitally). Without such a standard, the CSO won't be able to assess the usability of products and decide whether or not to further support their development. The UX community (yes, there such a thing in Israel) needs to come up with more viable ways to be a part of the start-up lifecycle, especially in the early stages. User experience research and design are often too expensive for startups and most experienced and talented UXers won't work for "options". There must be some way to get more involved. Investors have to ask the right questions before signing the check. In fact, it might be a good idea for investors to learn more about UX so that they can assess the product's promise based on the overall experience it can deliver rather than the technology it is built on. As you mentioned, there are optimistic signs of change. Some examples that come to mind are Boxee, Soluto, ClickTale, Waze and MediaMind. These are companies that chose, for one reason or another, to take their product all the way through to the market and try to compete over users' hearts and wallets. I hope there are many more to come. One point: as a founder of a startup that attempts to innovate on product and not technology, I recently met with a few Israeli investors. Every single one of them responded along the lines of "what is your innovative/defensible *technology*?" as one of the first matters they mentioned. (Granted, this may be specific to my case where they saw weaknesses in the product itself and thus reacted so). Still, what are you thoughts on the investor community side of things? How/If should they adjust? Adam - I couldn't agree more. The trick is to add a services layer to a solid tech foundation, not replace it. Bear in mind that pure service plays (like Netflix, amazon) need a huge local market to get off the ground - so not necessarily good role models for Israel. Michael - sure, we suffer from a supply shortage of Internet savvy designers, but my post is about the surprising lack of demand. Perhaps if there was more demand across Israeli high tech, the supply problem would begin resolving itself. Of course, this is just one facet of moving beyond tech. Nurit - as long as the university system is centrally controlled by the Council for Higher Education, I am not optimistic about a such programs. but it is certainly a good idea. Mike - from Wikipedia - The 2004 documentary Super Size Me states "McDonald's Chicken McNuggets were originally made from old chickens no longer able to lay eggs. These chickens are stripped down to the bone, and then 'ground up' into a chicken mash then combined with a variety of stabilizers and preservatives, pressed into familiar shapes, breaded and deep fried, freeze dried, and then shipped to a McDonald's near you." Pasha - all investors are different. its still good to bring something new to the table and to aspire to build a barrier to entry over time, but this does not have to be technology or patent based. Most investors belong to a different school of thought, and will tell you what Israelis are not good at and what they don't understand. don't listen to them. Allon - i agree with you. netflix, amazon are not role models for us. these were examples of "tech" companies that we forget were not founded with ANY tech. ideally, we leverage tech to build superior businesses. MySupermarket is a perfect example. some entrepreneurs would have gone to sell such a tech. you are actually using it to create a cool service and different business. bravo. looking forward to the wave - though design thinking might seem irrational to many technology centric teams and investors, the logic (results) has been written (users, engagement and revenues) on the walls for the last 15 years. really thrilling to see the leadership roles you, michael, eden, yaniv and others are taking on the investor side to find, encourage and fund the founders who are thinking different. hopefully all this will lead to great results for Israeli tech. Somebody needs to pick up this glove...While the Israeli government was very effective convincing capital to park in Israel, I do not think this is a task the government will get involved, its too specific and requires domain knowledge that would take time for the government official to understand and act upon. Perhaps several VCs can partner together, and help build the knowledge. I am pretty sure this would have a positive effect on IRRs and quality of deal flow. I've vicariously noticed your Post on my Google+ and I have to say it was like music to my ears. I can't pretend I've been following the debate or discussion in the aforementioned circles and the industry in general, but it is the intuitive positive feeling that comes from reading your words that makes me appreciate them. I am currently working for an Israeli Company which has signed a major contract deal with a Governmental Body abroad (I am now abroad for over a year and been working with my company for 5 years). We've kicked-off the Project almost a year ago and are now in the process of culminating to what should be a first installation and Go-Live. We've gone, together with the Customer, through the normal process of Training, Translation of their Requirements to Design, Configuration of that Design, Testing and now nearing the First Implementation. While the help and support the customer received from us is, in my opinion, been an excellent example of how Vendor-Customer relations should exist, unfortunately the company's approach, or rather Target has always been, through many Critical milestones, to Implement. This then creates the obvious outcome of no Strategy nor Customer Management. This passive approach creates in my opinion the wrong impression on the customer that this should be their priority while ignoring the critical and obvious challenges that are waiting around the corner (i.e. Business and Technical Support). Our advice to the company has been throughout the process to advise cautiously and educate the customer on the Dependencies and Risks of its own decisions (i.e. remove hidden assumptions). This advice has been regarded by the company as a possible hazard to the Implementation’s timelines and was ignored over and over again. The obvious desire of a Commercial company to gain profit is understandable, however, the long-term vision of User Experience and Support seems to be virtually non-existent when the only interest of a company is to implement. When I compare your words to my experience, it is obvious here that even for a company that stepped beyond the start-up barrier to Business realization, the commercial drive still plays a major role and for companies with short-term vision this will play against their Customer’s Experience and Support. Therefore, I believe there needs to be a major mentality paradigm shift which needs to occur in Israel, and it has to do with the Service Level, with Business understanding, and long term relationship while maintaining a large customer-base. This of course begs the question of the Chicken and egg, "are we so focused and aimed at the Technological aspect of the industry because we don't understand service and user experience (our own mentality), or is it the fact that we remained (by and large) in the Technological aspect of innovation the reason which doesn’t allow us to march in forward and create Business orientated companies which not only enable technology but rather apply it. Very insightful post, thank you Adam. I think you'll find these themes are largely replicated in quite a few deep technology hubs. I'm an Israeli currently based at Oxford and work with software (in one form or another) spin-out companies from the University. We face a somewhat similar problem - we're working with extremely talented and passionate developers who have started to develop really cool technologies during their studies (usually Dphil which is Oxford speak for PhD), but the product and revenue vision is not yet there. What we started doing earlier this year is 'incubating' them by providing them with commercial mentoring, product/business development expertise, and introduction to real world clients which they can use as a POC for their product. We also effectively allow them to start trading before incorporation which forces them to start thinking product and business model very early on(they trade through the university's tech transfer company.) We'll be starting a business module for them taught by the university's business school and pairing with potential MBA students with relevant industry experience next year. The nice part, is that it is going really well! www.theysayit.com - really ground-breaking text analytics \ sentiment analysis technology, but originally conceived as purely an engine (API access only). By paring it with one of the big healthcare regulators in the UK, and a well known integrator, we're expecting to reduce the number of human analysts used by the former by an order of magnitude(!) within a few months. More recently, we've made contact with a strategically placed financial advisory firm founded by ex senior-Mckinsey partners in NYC to jointly develop a product for the political domain - watching the two teams work together bringing in deep technical experience with decades of customer facing experience is fascinating (and I believe will turn into something really unique in the very near future). Israelis are not interested in making their products look pretty, rather, they are interested in having their products be very useful. The average Israeli citizen is much more competent in the use of technology than the average American. Americans will not use a product unless it 'looks pretty' or is 'easy to use'. Israelis on the other hand are more interested in having products that can benefit them in many intiuitve ways. They are willing to spend an extra three seconds to figure out how to use their product. Regardless, I do acknowledge that design is important and that Israeli products could be better if they looked nicer. A big source to this issue is the lack of Israeli designers. Many Israelis with many talents often opt to peruse computer science as opposed to other fields. The government will often let individuals peruse working on startups and individual prospects in order to gain experience before working for the army. These individuals do not have to complete standard army work (which is often considered mundane), and instead work for Israeli intelligence. These talented people often receive benefits from the country during these years. In contrast, the government does not require that their products 'look pretty' as long they work. Being a software engineer myself, I do not believe that Israel is headed in the wrong direction here. Other countries will begin to grow reliant on Israel to develop the essential technologies that are the heart to successful products. Although many people can reiterate a design, it is the original idea / research that fuels future achievements. People often underestimate the value of the customer experience. You could have the most technologically advanced product but if customers hate dealing with you, some of them will buy from competitors who respond to their queries and care for their needs. Whether they develop software or furniture, all businesses must pay attention to this. If you have a problem of your leg not to try walk over tricky grounds particularly amid fall and winter seasons. Also, take after your specialist's guidelines painstakingly, particularly on appropriate utilization of the strolling apparatuses. Obviously, you need to purchase arm crutches that match your tallness. It’s a great platform regarding to one of our main problems! First I saw about them on the internet, and after linking to them I was really comfortable! Recommended to all! Move from home of 18 years was made much easier by the team from moving company in Toronto, Highly recommend using them. They were informative on process, timing, very courteous, and exercised care with with our possessions... and above all very patient with the questions that came their way. The imei number is called International Mobile Equipment Identity. These futuristic shuttles would be used for military, commercial, and residential purposes technological advancements.. Typically people who have disabilities or injuries, or older adults who are at increased risk of falling, choose to use mobility aids. This mobility aids provide several benefits to users, including more independence, reduced pain, and increased confidence and self esteem. Walking frames or zimmer frame like all walking aids are used for two purposes, as a tool for rehabilitation when the user is recovering from an injury or operation, and for long term use when the user has a permanent difficulty with walking unassisted. American-Israeli living and breathing Israeli high-tech; partner in the Herzliya office of Bessemer Venture Partners; happily married with a darling little daughter, and now a cute son too. The thoughts and opinions expressed herein belong to the author and do not necessarily reflect those of Bessemer Venture Partners or any of its affiliates (“Bessemer”). The material here is written on the author’s own time for [his/her] own reasons and Bessemer has not reviewed or approved the information herein. Any discussion of topics related to Bessemer or its investment activities should not be construed as an official comment of Bessemer.